For the last two years, I’ve lived in a place where the sun rises over the Caribbean and sets over the Pacific Ocean, always in a blaze of orange and pink. The flowers pop with incredible yellows and fuchsias. Pristine beaches, tropical jungles, and more than 1,500 species of birds and butterflies are at your fingertips. Soccer is the second language to Spanish and people treat you with a “Welcome Home” hospitality. Here is a guide to things to do in Panama, from swimming with manta rays to a romantic cloud forest hideaway to tasting the world’s best coffee at the source. While still a fairly new concept in the country, Panama is working towards environmental friendliness and conservation throughout the nation. Governmental agencies and environmental NGOs have helped put some protective laws in place, but, like with so much in Panama (a country that is just a bit smaller in size than the state of South Carolina and called home by one-third the amount of people of New York City), the locals are the backbone and the heart of the movement to reforest land that had once been deforested, conserve their pristine sources of water, implement new systems of proper waste management, and educate one another, starting with the children. There are 76 protected areas of parkland spanning nearly five million acres of dense tropical jungle, dreamlike cloud forests, colorful coral reefs, lively mangrove habitats and more making up approximately 25% of the country’s land mass. 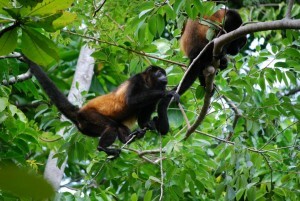 The majority of these protected lands are the 13 national parks and marine parks, (see the Isla Coiba experience below) and one international park, the massive Parque Internacional La Amistad in which you can hike up the steep Continental Divide and stand at the top with one foot in Panama and one in Costa Rica. Book a room at the eco-friendly Doubletree by Hilton Panama City, which opened in late 2011, just off the conveniently located Via Espana. Boasting the consistent high level of service that you’d expect from the hotel chain with an extra touch of Panamanian hospitality, upon entering the hotel, guests are greeted warmly in both Spanish and English, and then given the signature Doubletree chocolate chip cookie, here just as gooey and tasty as ever. Guests can choose between standard, executive, or deluxe rooms and a variety of suites, all equipped with the chain’s trademarked Sweet Dreams beds, Panamanian coffee, and Crabtree & Evelyn bath products and lotions. A good-sized gym, rooftop pool bar and Jacuzzi, and one of the only recycling programs you’ll find right now in Panama, round out the hotel’s greatest comforts. For a taste of the cosmopolitan mixed with culture, stay at the sleek Radisson Decapolis Hotel (Avenida Balboa, behind the Multicentro Mall) for ultramodern amenities mixed in with a local art décor—indigenous mola cloth patterns, devil masks, and large photos of the Panamanian people and traditional customs. You can’t miss the spectacular views of Panama Bay, the bustling city skyline, and Casco Viejo. Or, stay in Casco Viejo with fellow socially conscious travelers from all over the world at the acclaimed hostel Luna’s Castle. For just $12 a night in the dorm or $28 for a private room, it is the perfect backpacker’s destination complete with an outdoor terrace, make-your-own breakfast of pancakes, local bananas and locally grown coffee, and free Internet access and WiFi. It’s also steps away from the start of the Cinta Costera. Another recommendation is Tantalo Hotel, a boutique hotel/kitchen/roof bar by Blesso Properties NYC. Hook yourself up with the eco-minded ANCON Expeditions for the ultimate in car-free travel and a magical ride on the famous Panama Canal Railway. The 10-hour train experience will take you over the Canal at Gatun Locks, a UNESCO World Heritage Site. You’ll speed alongside the Chagres River, wind through lush, rainforests with its swinging monkeys and three-toed sloths, and you’ll visit the ruins of Portobelo, one of the Spanish Empire’s most important 17th century posts and a target for pirates and buccaneers for hundreds of years. The return back to Panama City is on the Trans-Isthmian train, originally built for the Forty-Niners during the California gold rush. ANCON Expeditions also offers one-of-a-kind adventures, usually spanning three to four days. Stops include the jungles of the Darien province, the Kuna Indians, stunning San Blas Islands, and National Marine Park Isla Coiba. 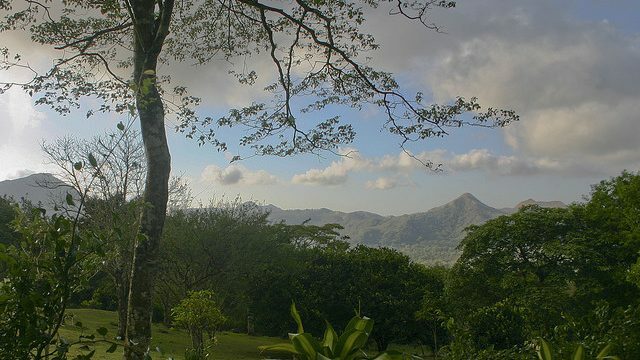 You can also get a taste of some of the country’s highlights by taking “The Green Tour of Panama” with GreenSpot Travel, named one of Conde Nast Traveler’s 2011 Top Travel Specialists. This nine-day tour begins in Panama City where visitors will stay at the Canopy Tower Lodge in the heart of Soberania National Park and sleep among the trees at different levels of the forest canopy. Other highlights from there include a visit to the Miraflores Locks of the Panama Canal; a flight to Boquete, Chiriquí and stay at the Finca Lerida Eco-Lodge, renowned for its bird watching offerings; a voyage to the Caribbean coast and Bocas del Toro to ride bikes sea kayak, snorkel, and maybe even learn to surf. There are few better places to ride a rented bike, rollerblade (still super popular here), jog, or walk than along Panama City’s Cinta Costera, a three-plus mile path and park system built alongside the beaches of the Panama Canal. Completed in 2010 to make the city a more pedestrian and exercise friendly place, every afternoon and evening you’ll find pick up soccer, basketball and volleyball games (visitors always seem welcome), and a family environment; park and local police make sure everyone’s able to enjoy themselves healthfully and safely. 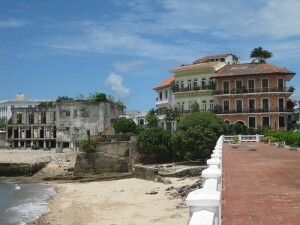 Bike back to Casco Viejo, declared a UNESCO World Heritage Site in 1997; where mansions, guesthouses and Panama’s Presidential Palace kiss next-door ruins. Stop at the famous Fish Market for the freshest of locally (and usually up-to-the-minute) caught fish. Taste an array of delicious ceviches, and have artisanal sandwiches and cervezas at Super Gourmet market, where the local Balboa Beer is always on tap. Make your way across the country, heading west to discover a whole other flavor of Panama. First stop is El Valle de Anton, just over two hours outside of Panama City heading west on the Interamericana. Get there by bus (fare is only $3.50), leaving Panama City every half hour from 7am to 7pm each day. After traveling up into the cooler hills of El Valle visitors will find themselves in a valley full of protected forests and locally grown fruits, vegetables and plants for sale at the Sunday Market. It’s easy to see the sights here by bike, foot, or horseback. Make sure those sights include a stop by the El Valle Amphibian Conservation Center to catch a glimpse of the recovery efforts to save Panama’s golden frog (said to bring good luck to anyone who sees one) from becoming extinct. Take a short hike up to some of El Valle’s most picturesque waterfalls, passing La Piedra Pintada (“the painted rock”) on your way to hear the story of these hieroglyphics told by a few local boys, in Spanish. Eat lunch at La Casa de Lourdes (off Calle El Ciclo), where the menu changes seasonally and features French-and-Asian influenced Panamanian delicacies. Before you head out be sure to stop at the Centro de Produccion de Orquideas de El Valle, a small volunteer-run conservation association boasting approximately 100 native species of orchids in its greenhouse. Your next stop off the bus along the Interamericana should be in the province of Veraguas (take a bus from Panama City direct to the bus terminal in Santiago, Veraguas, $9.10 one-way). Here, you’ll find a whole other side of Panama, the real heart of it all. Take the chiva (small bus) to Puerto Mutis, but be sure to stop off in the tiny town of El Pilón and its rolling hills and farmland dotted with cows and chickens. A model Panamanian community working towards environmental conservation and change (at left: the author pitching in as a Peace Corps volunteer), the locals have implemented a recycling program—other than in the city, recycling is still a rare concept throughout the rest of the country—dedicated themselves towards the practices of environmental education, and offer eco-tours supported by a grant from the United Nations Development Program. The tours of a protected mangrove forest take visitors through the mangroves on foot and by small boat, and typically last about three hours. Lunch can be included upon request. Contact Romulo Pineda, romulopromero@hotmail.com. At the end of the bus line is Puerto Mutis, a quaint little port town where your fried fish at Pacific View Restaurant comes to your plate just minutes after it’s been caught and the seafood stew is a delightfully salty combination of local conch, crab, and what we know as Caribbean lobster. Puerto Mutis is also a jumping off point for Isla Coiba, about a three-hour boat ride away during which humpback whale and dolphin sightings are common. At Parque Nacional Coiba, you’ll snorkel or scuba dive among sea turtles and manta rays, among marlins and tiger sharks, among the most spectacularly ornate coral reefs, the second largest-coral reef in the eastern Pacific Ocean. The completely protected 493 kilometers of marine park is run by ANAM, the Panamanian environmental protection authority, which offers visitors accommodations in six small cabins, featuring a kitchen, a dining area, and electricity only after sundown. Rates are $10 per person per night, plus a one-time island entry fee of $20. For a break from the heat and a venture up to the Panamanian north, one must head to the province of Chiriquí and the towns of Cerro Punta and Boquete. Famed for their mountainside farms that look like patchwork quilts of vegetables, crisp fall-like temperatures, spectacular waterfalls, and the magnificent Volcán Beru, Cerro Punta and Boquete are two of the most sought after spots in the country to visit and also to relocate as an ex-pat. Landscape-wise, you could almost be in Aspen. 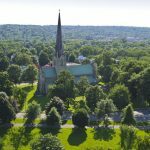 The artisan shops and art galleries are one-of-a-kind, the orchids, lilies and other flowers grown here are sent to florists and supermarkets across the country, and the strawberries and cream may just be the best you’ll ever have. 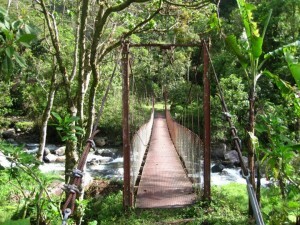 In Boquete, a plethora of tour operators offer guided eco-friendly adventures such as hikes up the Continental Divide, famous Boquete coffee tours (both organic and conventionally shade grown), which some argue is the world’s best coffee, horseback riding, cloud forest exploration, white water rafting, canopy zip lining, and more. Contact Coffee Adventures (ask for Terry) and Boquete Outdoor Adventures (ask for John). The place to stay is Los Quetzales Lodge & Spa in Cerro Punta, a true getaway from the busyness and technology of life and into the serene peace of nature. 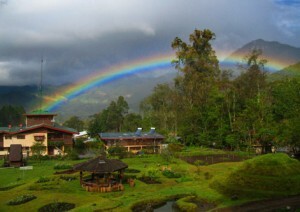 Nestled away in a cloud forest 7,260 feet above sea level, the Los Quetzales Reserve boasts the highest lodging facilities in the country and is inside the forest of Volcán Beru National Park. Visitors can stay in their choice of quaintly decorated rooms in the lodge close to the spa, dining room, and common area, or the highly recommended cabins, a hike or tractor ride up into the mountainous jungle. The wood cabins offer the most private and romantic of experiences, complete with lantern light (there is no electricity here but there is delightfully hot water in the showers and tubs which you’ll crave in the cold mornings and evenings), wood stoves, and expansive balconies that overlook what feels to be your very own rainforest. 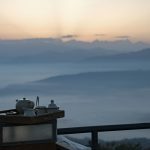 Hike down the mountain back to the lodge for the freshest of dining experiences to savor dishes like crepes de maiz (corn) with salsa, coconut lentil curry soup and pizza with vegetables straight from the property’s garden. Organically grown garden veggies include snow peas, red lettuce, cabbage and watercress, which you won’t find anywhere else in Panama. Delicious breads are baked on site, and fresh cheese, yogurt, cream and butter from the lodge’s own cows are made daily. 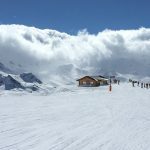 The website has all of the prices for the different lodging experiences, and there are also all-inclusive packages, some of which include free uses of horses, mountain bikes, fishing rods, sauna, and birding tours. Bocas del Toro is known as many things: The pristine tropical island-hopping hideaway; the funky worldly backpackers haunt; the surfers paradise; the romantic rendezvous; a place you simply do not want to leave, and it is know around these parts that many never do. 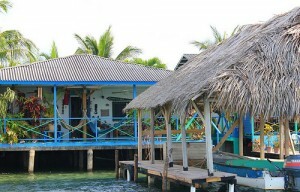 The ideal spot for fish tacos, local beers, bike riding, Panamanian trinket shopping, and dancing ‘til dawn, Bocas del Toro truly does seem to have something for everyone. The best way to do it is spend a few days and nights on the main island, Isla Colon (also known as Bocas Island) and hop a motorboat to a nearby, yet un-touristy isle. There is so much to do throughout the archipelago that at least three to four days is recommended. Fly into Isla Colon on a small plane from Albrook Airport in Panama City. Some must-dos on Isla Colon include renting a bike from one of the many main street vendors and cruising around town to get a feel for the Caribbean-style culture of it all. Stop to buy pure, local chocolate or visit the local tour operators in town to arrange a boat trip out to Red Frog Beach, nearby snorkeling, or a visit to the Smithsonian Tropical Research Institute. On Isla Colon, stay at Cocomo-on-the-Sea, a little American-run hideaway built right next to its private docks offering free breakfasts of homemade pancakes, shabby-chic beach style décor, and plenty of hammocks to laze away in the afternoon breeze. 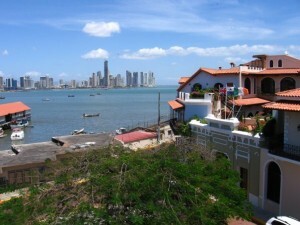 The best time to visit Panama is during their summer, January—March before the rainy season begins. July-August and October-November are nice as well, and in November visitors will experience an entire month full of patriotic Panamanian festivals and fiestas commemorating the country’s independence from both Spain and Colombia. Fly into Aeropuerto Internacional de Tocumen (airport code: PTY), and from there can start your familiarity with the city’s ever-growing public transportation system. Ground was recently broken on what will be Panama’s first ever subway, but for now, MetroBus is the capital’s fuel efficient, natural gas-run fleet of comfortable, clean, and air-conditioned (for this you will be thankful) buses. A trip from the airport won’t cost you more than $3 (which includes the one time purchase of your plastic MetroBus card that can be refilled throughout your stay in Panama City). The bus will take you to Albrook Terminal and adjoining massive shopping mall, and from there you can take any number of other buses to reach your choice hotel destination. To get to both Chiriquí and Bocas de Toro, take a small plane from Panama City’s domestic airport, Albrook Airport, on Aeroperlas.